Even now, 25 years later, Ghostbusters inspires a cult fandom - just ask on our message board - but don't dare suggest the movie is any less beloved than they think it is. They can't understand why 6" Ghostbusters toys wouldn't be a viable line in the mass market, but are well-suited for Mattel's second-rate website. But there are some Gb toys that are not only available at real stores, but are also selling like hotcakes. Those, of course, are Art Asylum's Toys Я Us-exclusive Minimates. In court to defend themselves for their part in shutting off all power in New York City, Peter Venkman and the rest of the Ghostbusters wind up battling the notorious Scoleri Brothers and saving the life of Judge Stephen Wexler! Honestly, Ghostbusters II is rather underrated, particularly among those diehard Gb fans. It has a lot of great moments, even if the plot is generally a rehash of the first movie, and it definitely deserves toy treatment. This particular Minimate, as indicated by the bio on the back of the card, gives us a most unusual toy: Venkman not in either of his Ghostbusters uniforms, but rather in a staid black suit. Of all the Ghostbusters released so far in Minimate form, Peter Venkman has the best face. Perhaps it's just that the shape of Bill Murray's head is perfect for translating to Minimate form, but the expression painted on this featureless cylinder really sells the man behind it. It's smug, childish, slightly aging... everything Venkman is. The coif is probably too thick to be an accurate representation of Ghostbusters II, but at least they tried to capture his receding hairline. 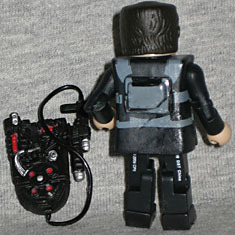 Peter has the same proton pack as all the other Gb Minimates, but it's over a different piece. While the others, like Ray and Egon, are wearing their jumpsuits, this figure is decked out in a fancy jacket. It's a new mold, and you can tell it won't be getting used for a lot of future Minimates (other than Courtroom versions of the other guys), since there's a giant plug on the back that the proton pack is glued to. Hard to believe this scene was the first time the proton packs were fired in the movie, huh? 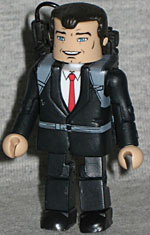 The pack's straps are just painted onto the suit, and the front is open just enough to show off Venkman's tie. Living up to their name, each of these TRU two-packs includes a ghost and a buster. The ghost in this set is a rather odd choice. An assault that targets famed monuments? No! Say it ain't so, Joe; say it ain't so! Although (let's be honest), as far as "famed monuments" go, Washington Square is pretty damn far down the list, somewhere behind the Flatiron Building, the Roosevelt Island tram, and "that diner from Seinfeld." Yes, there's a big arch there, but no one outside of NYC knows it by name. Hell, most people probably think that's in Central Park. And just as unmemorable as Washington Square Park is the ghost that attacked it. 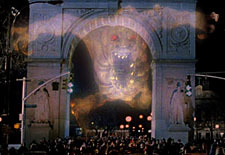 We're including this picture of the Washington Square Ghost, because without it, no one will ever remember seeing him. Especially since the toy looks entirely unlike the movie version. He's basically just a generic stop-motion movie monster, turned transparent and overlaid into the scene. The body is the same one developed for Slimer (who I've unfortunately not been able to get), cast in trans yellow and painted with a new face. The hands come from 2005's Lady Deathstrike, and the feet are shared with the Terror Dogs. Even with his knees bent to deal with the angle of his ankles, he stands 2¼" tall, a bit above average for Minimates, but still not as tall as he should be. The Washington Square Ghost falls into the same category as Mr. Stay Puft, Ivo Shandor and Azetlor, as ghosts who are way, way bigger than their Minimates would lead you to believe. Put them all in a display together, and pretend they're just very far away. The Washington Square Ghost is a very strange choice for this two-pack. 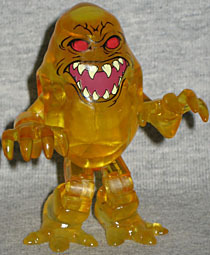 It seems obvious he was only included as a way to get some re-use out of the Slimer mold, but he's not exactly one of the most memorable specters in the series. Considering that we got Peter as he was seen in the courtroom scene, it would have made a ton more sense to get one of the Scoleri brothers, the electrocuted prisoners who pop in and tear things up. Still, with an unusual ghost and a fully unique 'buster, this is a pretty nice set.